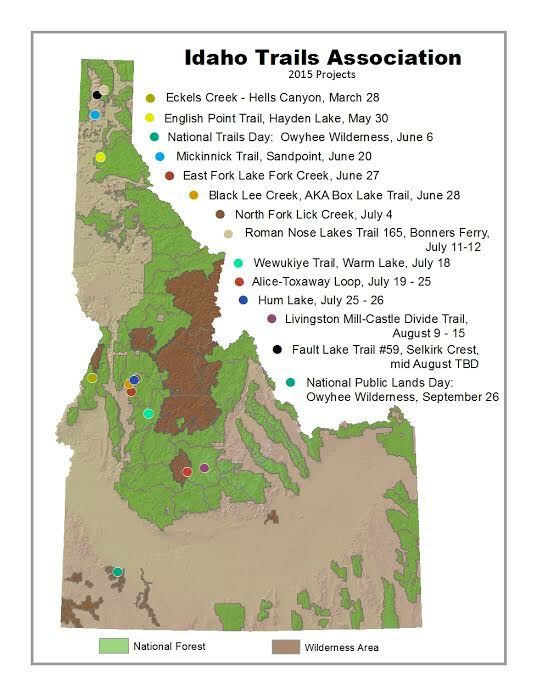 This 2016 National Trails Day will be the sixthh annual Idaho Trails Association, Boise REI, and Boise BLM work project in the scenic Owyhee Canyonlands. Work details: Back to Perjue Canyon Trail in Little Jacks Creek Wilderness for National Trails Day on June 4, 2016. 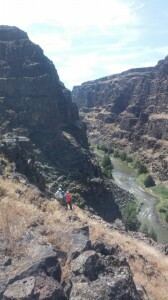 This is the longest Wilderness trail in the Owyhee Canyonlands. 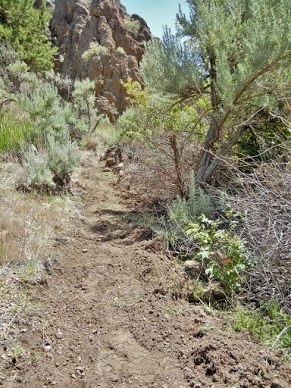 BLM and ITA have built this trail over the past several years (2013-now). Last year we did some serious brush work and in 2016 we will work on the tread of the trail. We will leap frog our way the entire trail and BLM will have shuttle vehicles to drive volunteers back to vehicles at main trailhead. Let’s have fun and be safe. Volunteers needed: 20 volunteers would be perfect. Youth seem to do fine as the trail is flat. If your plans change and you cannot make it. Please notify us & attempt to fill the project with another volunteer. When/Where: Volunteers from the Boise area should meet Saturday, June 4th at 7am at the Boise District BLM parking lot (3948 S. Development Ave., Boise, ID 83705) for carpooling (GPS coordinates: 43* 33’57.662”N; 116*12’23.394”W). The road to work project includes 6 miles of graded gravel road. Volunteers coming from outside Boise can meet up at the Poison Creek Recreation Site (GPS coordinates: 42*45’27.054”; 116*12’23.394”W), about 15 miles southwest of Grandview along the Owyhee Uplands Backcountry Byway (aka Mud Flat Road), at 8:30am. We will return to Boise BLM about 5pm. What to bring: All volunteers should bring their own small pack with snacks, sunscreen, and water. 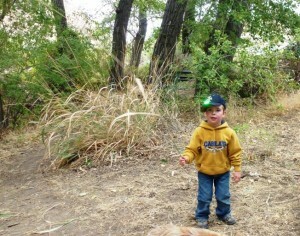 We will pack a lunch (provided by Boise REI & ITA) at beginning of day to eat along the trail. 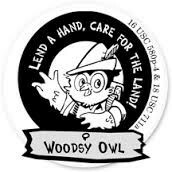 Volunteers should have hiking boots, leather work gloves, and eye protection (sunglasses or safety glasses). 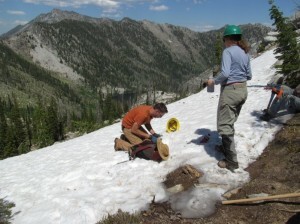 Bring trail tools if you have them; otherwise BLM and ITA will supply tools. The best tools for this trail work are a strong back, folding hand saws, heavy duty pruners, Pulaski’s and McCleod’s. National Trails Day 2015 was a success from the start. 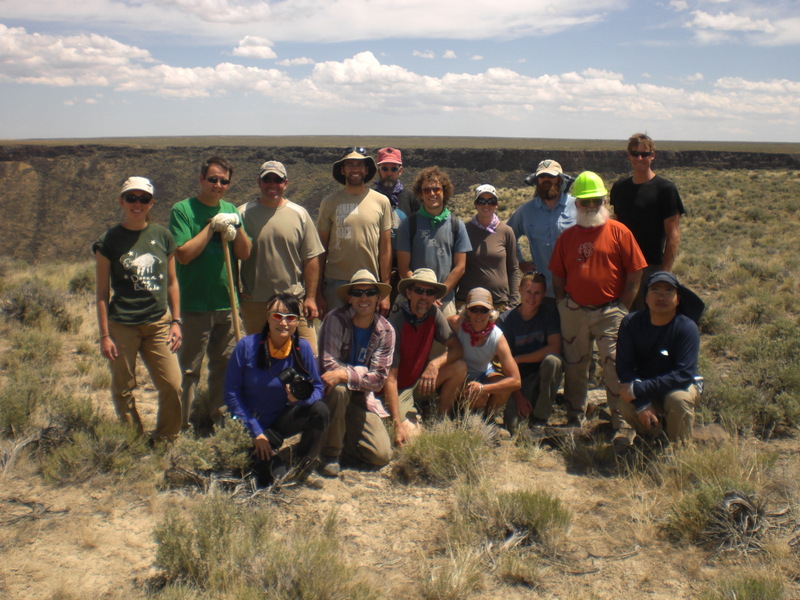 Volunteers met at the BLM field Office in Boise and carpooled to the Perjue Canyon Trailhead in the Little Jacks Creek Wilderness. REI supplied sandwiches, chips and drinks while volunteers provided homemade cookies for the return trip. 15 volunteers made the trip with BLM Recreation Staff David Draheim and ITA Executive Director Jeff Halligan leading the project. It was a 3 mile hike to the project site of brushing, logging out and tread work along the canyon bottom thick with Aspen, Alder and grasses. There was about 300 feet of trail tread reconstruction/improvement and about ¾ of a mile of brushing and logging out. The volunteers were treated with the presence of 2 young energetic volunteers whose positive energy and enthusiasm was enjoyed by all! Thank you Kylie and Hunter! We hope to see you on more ITA trips! 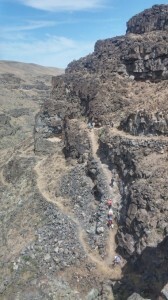 The hike back up to the trailhead was a real eye opener, as you climbed out of the lush canyon you were met with the heat of the Owyhee Desert afternoon. It was amazing how the deep lush canyons can hold the cool for so long in the day! It was a great day to be in the Little Jacks Creek Wilderness! Great news friends we have finalized dates for some of our 2015 projects! To sign up early for a project email intern@idahotrailsassociation.org. In the email make sure to reference the project(s) you want to sign up for. After you sign-up, an ITA representative will be in touch. In the future we will post a separate sign-up page for each project that will have more specific details about the project. Stay tuned for more projects, updates, and further information. 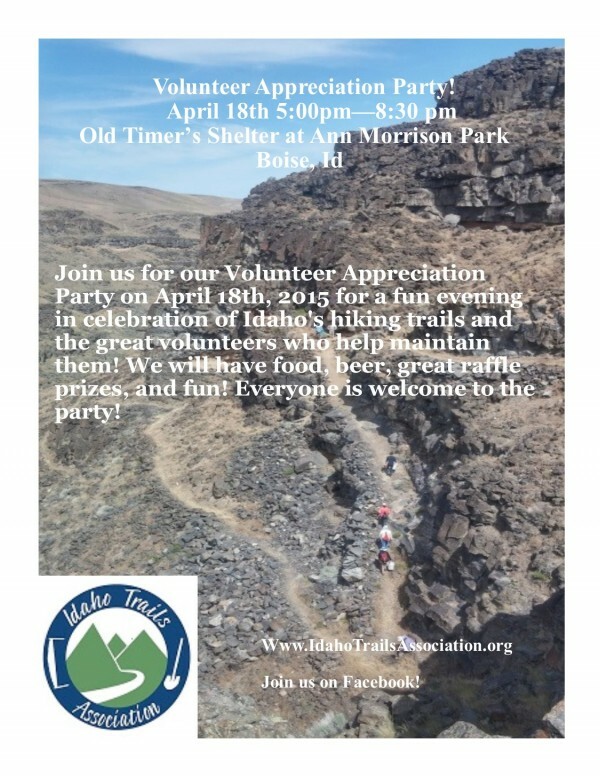 Thank you for your interest in volunteering with the ITA and we look forward to seeing you on the trails! From Toxaway side Possible 4 person backpack crew to meet up with Toxaway crew after working the Petit to Alice trail and Alice Lake. 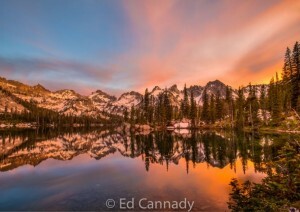 The non-motorized section between WA Basin and Little Boulder Creek as well as satellite trails including Chamberlain Lakes, Washington Lake, and Chamberlain Creek trails. First 2015 Project of the year! 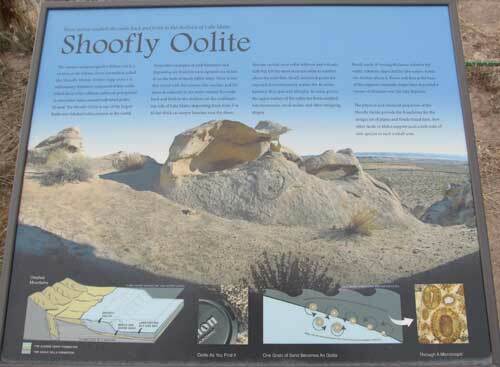 Oolite Interpretive Trail, Owyhees! 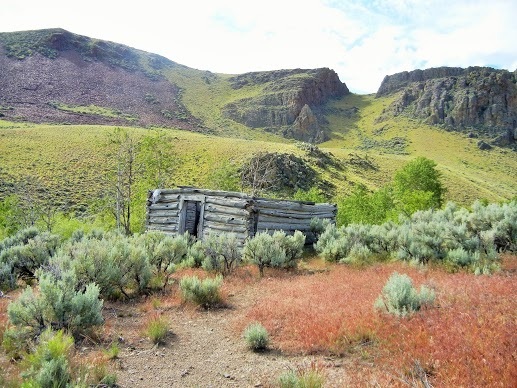 the Bruneau Field Office of the BLM to work on the Oolite Interpretive Trail in the Owyhees. Shoofly Oolite interpretive site trail: This is an interesting area to stop along the Owyhee Uplands Backcountry Byway to take a short hike. We would maintain and widen the 0.5 miles of trail from parking area to the Oolite mineral deposit cliffs where kids and adults explore the small arches, rare plants, and tiny fossils. We also need to beautify the parking area by removing some wire fencing and constructing a more people inviting wood hiker maze at trailhead. January 24, 2015. 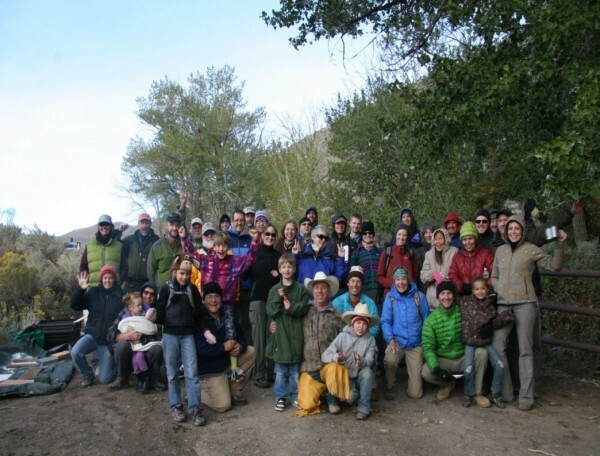 Meet at 9am at the Boise BLM parking lot (3948 S Development Ave., Boise, ID 83705) to carpool or 10:15 at the Shoofly Oolite Site. Return to Boise by 3pm or end of project about 2pm. This is about an hour and a half drive from Boise. It is South of Mountain Home and Grandview, Idaho on the Mud Flat Road. From Boise take the Simco Exit and drive to highway 167 and on to Grandview. Then turn east on Highway 78 to the Mud Flat Turnoff where you will turn south and drive to the Shoofly-Oolite Trailhead, just past the Shoofly Cutoff road. Update: The ITA/BLM will be providing hot dogs, buns and condiments for lunch. We will also have drinking water available, but bring your favorite drink or snacks if you would like something additional or different. Thank you project volunteers! We currently have 30 total signed up for this project and we appreciate the interest and enthusiasm. However, this is all we can accommodate on this project, so we have closed the signups. Thanks for your interest and please keep watching for future ITA Projects! 2012 Season Starts with a Bang! Cut the red ribbon, ITA’s 2012 season has begun! 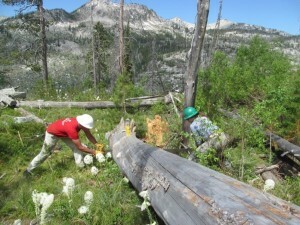 On June 2nd , Idaho Trails Association rallied 17 volunteers and agency partners to work on the Tindall Trail in celebration of National Trails Day. Tindall Trail is located in the Bruneau-Jarbidge Wilderness, which was newly designated in 2009. The trail goes into Sheep Creek at the confluence of Sheep and Mary’s Creeks. 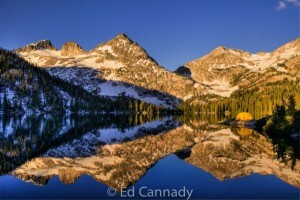 Tindall Trail is a great wilderness hike and camping site and is easy to find. ITA volunteers were delighted to work with our BLM partners to improve this trail for our second annual BLM National Public Lands Day project. ITA volunteers constructed and maintained 1 mile of trail, including 10 new water-bars, and a new trailhead. 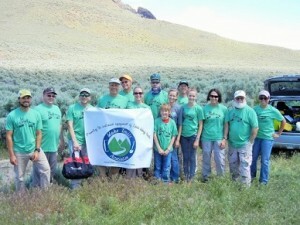 ITA wants to give our volunteers and BLM partners a big thank you for the talent and hard work you provided! and sign up to volunteer for upcoming2012 projects!